Summer is upon us. On Sunday I escaped from the sweltering city to the slightly less sweltering Hudson Valley. Despite a weekly influx of fresh fruit from my CSA, I couldn’t resist stopping off at Fishkill Farms for a little pick your own action. 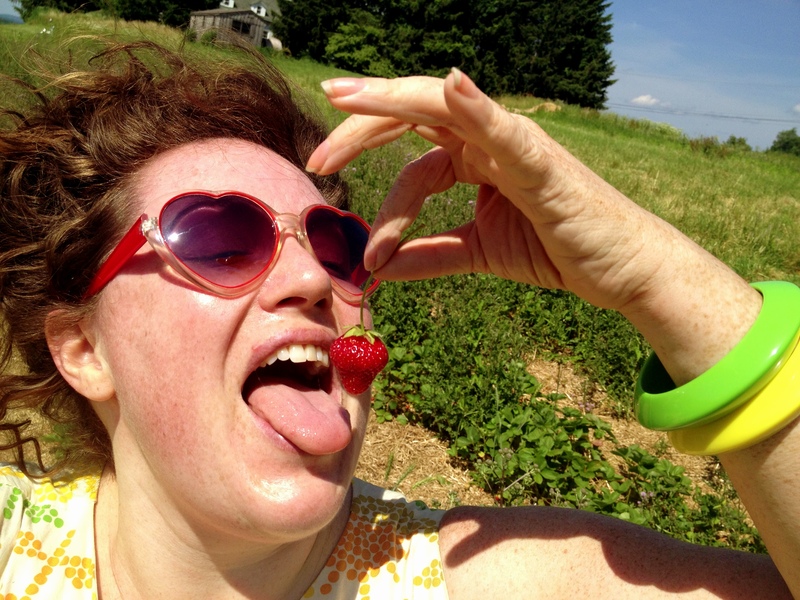 The sun was so strong that the strawberries and I were reddening at an alarming rate. The cherry trees offered some welcome shade and some succulent fruit, though I could have used the help of someone a bit taller. Standing on my tippy toes, I managed to fill a couple of quarts–and also rain quite a few cherries down upon my head. I left a mixed quart with my little sis in Poughkeepsie and polished off a good quantity on the winding late night drive home along the Taconic Parkway, the supermoon guiding my way. Somehow I managed to reserve enough cherries for one of my favorite recipes. Rinse your cherries and place them in a ceramic bowl in the refrigerator for at least a couple of hours. Grab the cherries and a juicy novel, crank the fan on high, and sprawl out in the middle of your bed. Place the chilled bowl of cherries on your stomach and commence to indulge. If anyone has tips for getting cherry juice out of sundresses and sheets, I’m all ears! This week’s CSA share brought green onions, also known as spring onions. While one can just use them in place of regular onions, I wanted to take advantage of their delicate flavor and natural sweetness. Shelled peas at the farmers market provided inspiration. 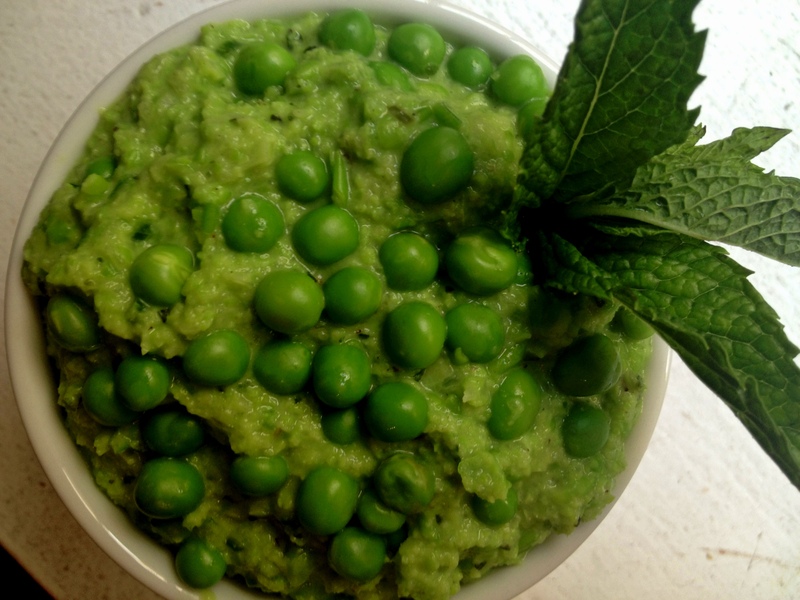 Bring a small pot of well-salted water to a boil and add the peas. Simmer for two minutes or so and then rinse quickly under cold water to stop the cooking. The peas should be bright green and still firm. 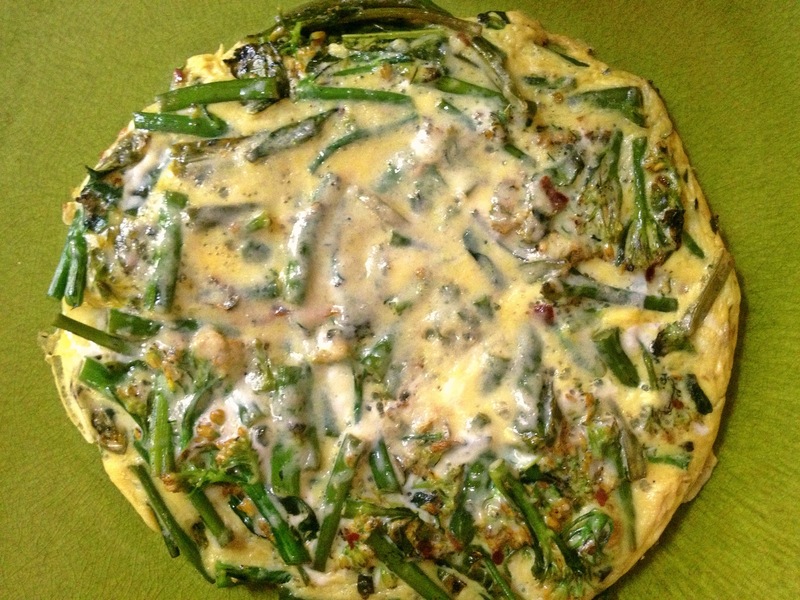 Saute the spring onions in 2 tablespoons of coconut oil over medium-low heat, taking care not to let them brown. (You could use some other light oil, but the coconut oil really brings out the sweetness of the onions and the peas.) When your onions are wilted, add the scape and cook for a couple of additional minutes. Then crush and sprinkle in the Herbes de Provence, allowing the oil to rehydrate the dried herbs. Toss the onion mixture, the remaining tablespoon of coconut oil, the vinegar, the mint and all but a tablespoon of the peas into the food processor. Gradually add water until the mixture is just loose enough to catch on the blades. (I’d guess that I ended up using about 1/3 cup.) Add salt and pepper to taste and continue processing until you have an even texture but not a true purée. I am happy to report that this pairs nicely with a semi-dry Riesling, gin and tonics with rhubarb simple syrup and a dash of orange bitters, or your morning coffee. Yesterday was the longest day of the year–and a glorious one at that. A classmate, neighbor and new friend joined me for a wine-soaked celebration of the season’s bounty. Turns out we have even more in common than expected. This includes an inability to pass up a farmers market. Between our mutual addiction and our individual CSA shares, we had quite a few vegetables on hand. We also had some lovely pork chops thanks to Lewis Waite Farm. 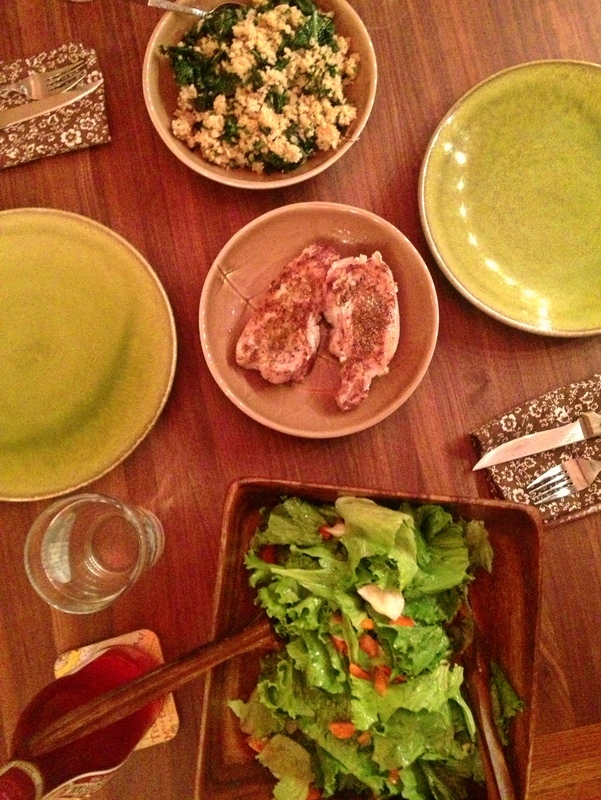 Several glasses of wine and a couple of hours of gossip later, we sat down to a bulgur-kale pilaf with garlic scapes, green onions and parsley; coriander, cumin and fennel-crusted pork chops; and a green salad with celery, carrots, turnips and a goat milk yogurt vinaigrette. 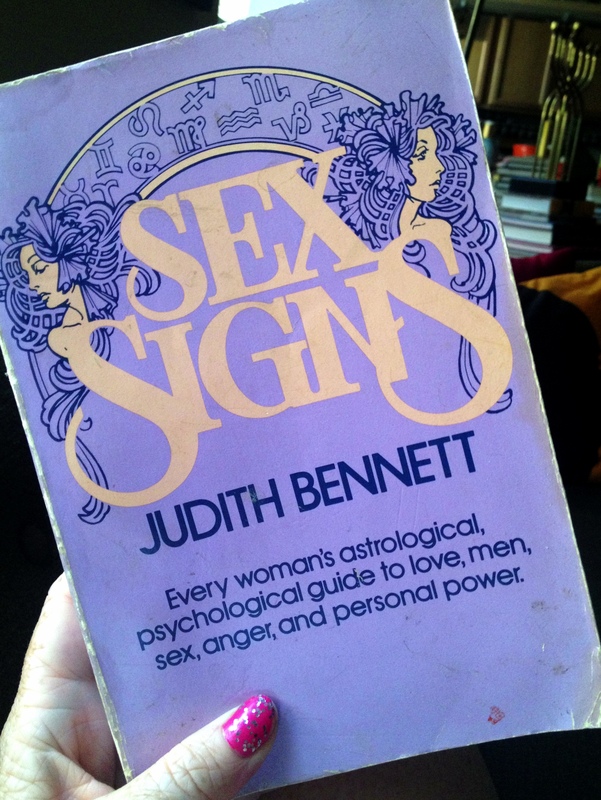 We rounded the night out with a little rum and some armchair astrology circa 1980. This morning found me downing a cup of coffee before dashing out to run errands. A friend was in the area with her dog, which led to more coffee (iced this time) and a little too much sun. Naturally, I had to swing by the Grand Army Plaza Greenmarket for yet more vegetables. By the time I arrived home, it was after 1:00 and I was in serious need of some food to cushion all of that caffeine. 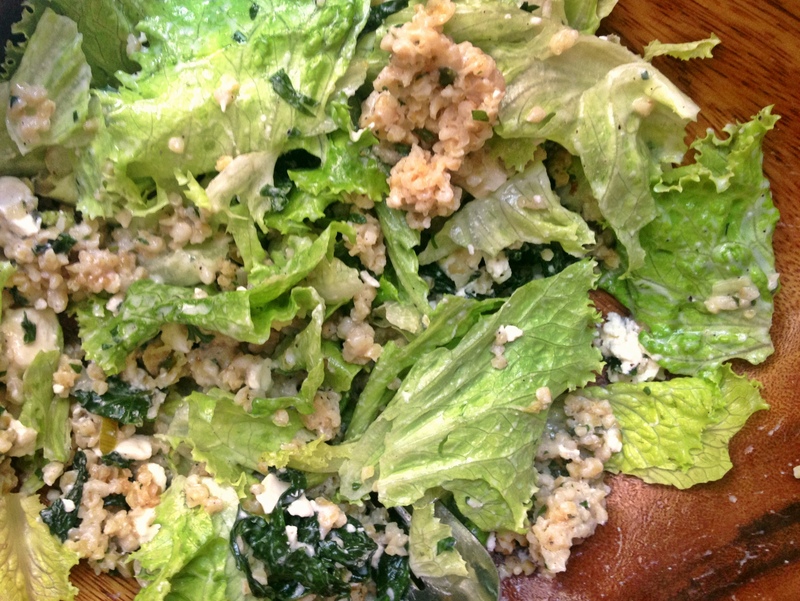 Luckily, in my tipsy state, I had still managed to pack up the leftover bulgur-kale pilaf. (Even better, Sara had done ALL of the dishes.) I replicated last night’s vinaigrette, using two tablespoons of goat milk yogurt, one tablespoon of white wine vinegar, one tablespoon of olive oil, a pinch of salt and some freshly-ground black pepper. 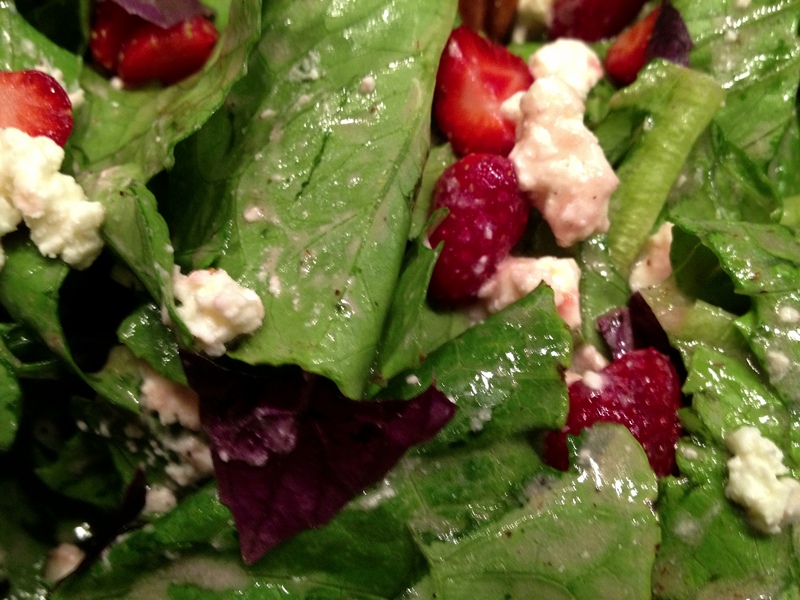 I tossed this in a bowl with some green leaf lettuce, the leftover pilaf and an ounce or so of crumbled feta. You could do the same with leftover rice, quinoa, or pretty much any grain and whatever vegetables you have on hand. This makes an ideal light summer lunch that you can whip together in minutes. 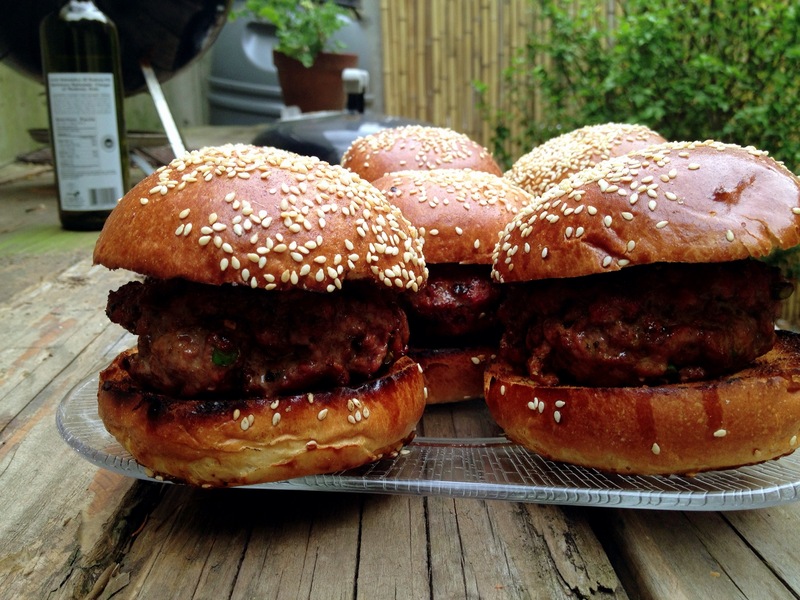 Ground lamb with garlic scapes and Ras el Hanout on a brioche bun topped with harissa-paprika mayo makes for a lovely Father’s Day cookout. This is a big week. 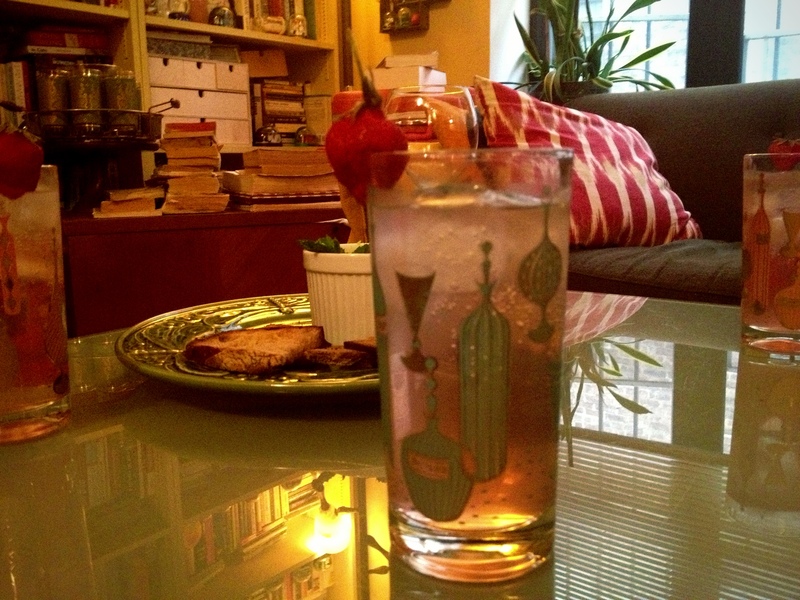 CSA season started and the teenage vegan is making her annual pilgrimage to New York. Rather than camp out on an air bed in my living room, my baby sister will be interning with the Powerhouse Theater for six weeks and, much to my delight, bunking in my old dorm. She was scheduled to fly into LaGuardia at 3:00 this afternoon. It is now after 8:00pm and her flight to White Plains (yes, White Plains) has yet to depart. 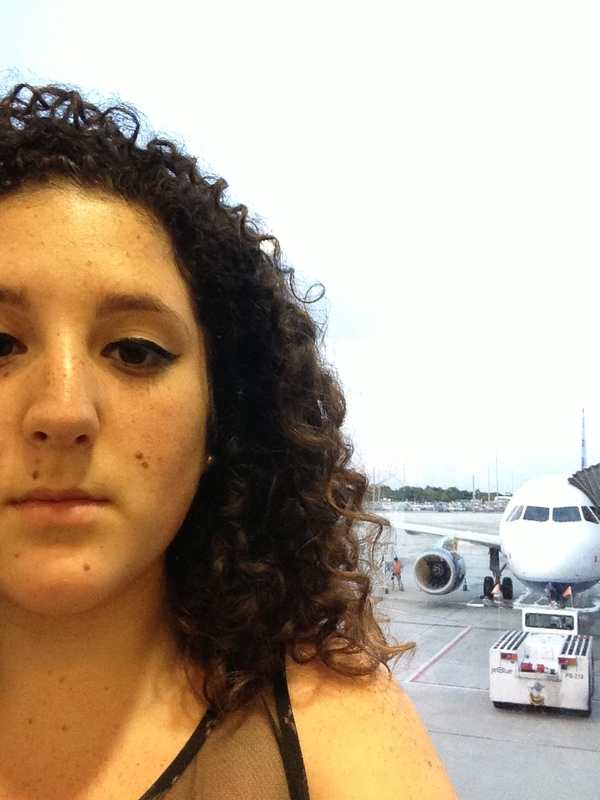 This is Eliana and the plane that may or may not bring her to New York tonight. I had planned a lovely vegan dinner for two. Alas, it looks like I will be dining alone. Boil a little water, pour it over the shiitakes and let stand while you get your rice going. Bring a wok or large heavy-bottomed skillet up to medium-low temperature with the vegetable oil, chili oil, garlic, ginger and sichuan peppercorns. (I might recommend crushing the peppercorns up a bit, which I did not.) Once your pan starts sizzling and from then on, be sure to stir almost continuously. Cook for a couple of minutes until the oil is infused, add the onion, crank up the heat to medium high, and stir-fry until the onion starts to brown around the edges. Add the Happy Rich and cook until just starting to go limp. Toss in the seitan. Add the vegetable stock or tamari, rice wine vinegar and the shiitakes with their liquid. Cook, stirring constantly, for a minute or two until the liquid has boiled off. 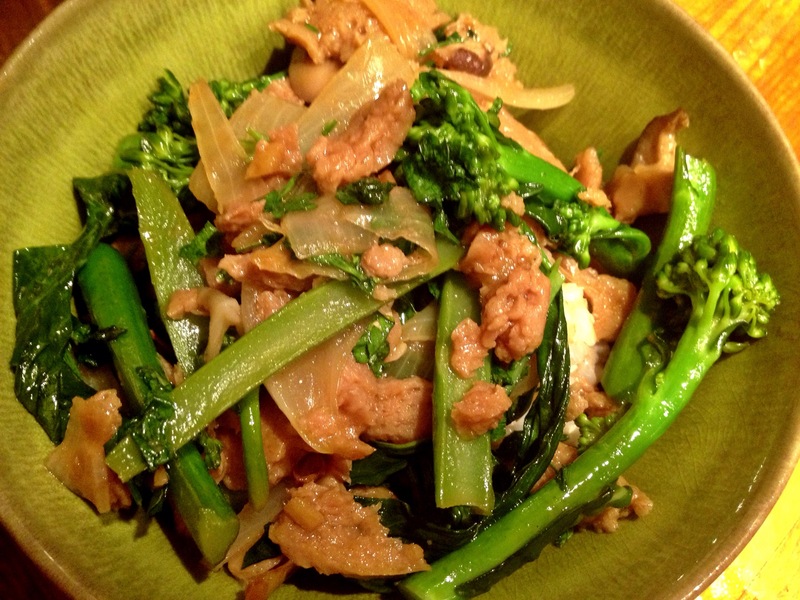 Remove from the heat and stir in the sesame oil and some fresh flat-leaf parsley if you happen to have some languishing in the fridge. Polish off half of this with the remainder of the surprisingly full-bodied Pinot Gris you’ve been nursing all week. Pack the rest in a recycled takeout container to present to the teenage vegan–if and when she arrives.